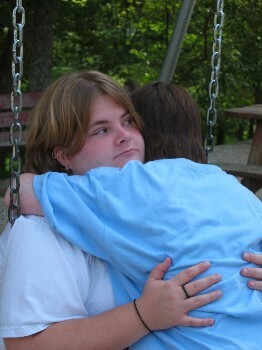 Youth Haven Bible Camp is nestled into the mountain country of Lee County in Kentucky. At the camp, many activities are provided, including horseback riding, fishing, swimming, a waterslide, paddleboating, canoeing, team games, a talent show, hiking, picnicing, and many opportunities to have personal encounters with Christ. The first of week at Youth Haven is teen week, followed by two grade school weeks, a rental week, then another grade school week. After that two Sunshine weeks (for the mentally and/or physically challenged) take place and finally a work week where groups from around the nation come to repair, paint and build things around the camp and other projects of Kentucky Mountain. Check out their website, or my pictures from camp 2004 and 2005.